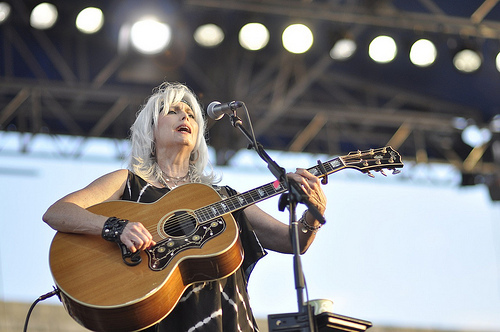 Emmylou Harris, a chart-topping country music star and 12 time Grammy winner, not only has a passion for singing, but also for helping animals in need! This "Queen of Country" runs a dog rescue right in her own backyard in Nashville. She named the rescue Bonaparte's Retreat, after her "soul mate dog" with whom she traveled for many years. Through her partnership with Metro Animal Control who, by law, have to destroy many dogs and cats every month, she rescues dogs from death row, some just minutes away from death. She is not only interested in rescue, but education as well. A big advocate for having pets spayed and neutered, she believes that the issue of people not spaying and neutering their animals needs to be addressed. Emmylou's rescue has saved many lives throughout the years. Every Saturday, foster families bring the adoptable dogs together in places such as the park, or even her own back yard, where the dogs can socialize and be showcased for adoption. Potential adopters fill out adoption forms and then, after a 2 week waiting period which includes home visits to make sure that both family and dog are a good match, the adoption is finalized. Emmylou currently has 29 rescue dogs, 10 of which are in her own backyard shelter. In addition to Bonaparte's Retreat, she is in the process of forming Crossroads Campus which pairs people and animals in need, providing both with financial and emotional support. This is one superstar who deserves accolades not just for her talent, but for her big heart as well!